Thank you again for the wonderful turnout to my first before and after party. I thought I would share a few of the entries even though everyone had wonderful before and afters. This is Marsha's new dining room. You can see more of it here. Love the chest transformation that Rene did. Love this Ballard knock off that Tracy made look even better than the original and so much cheaper. 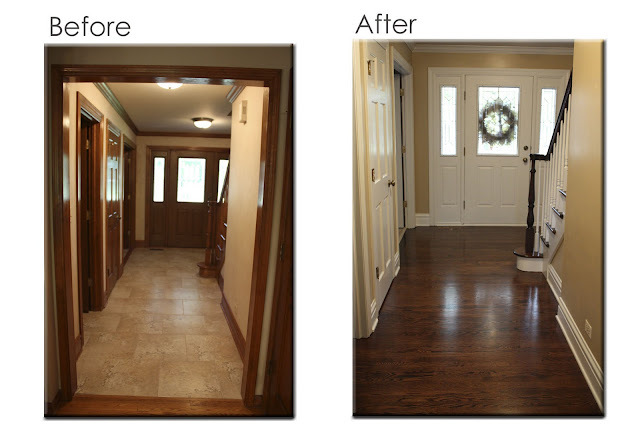 Check this makeover out at Two Story Cottage. Be sure and check out the before of this piece. You won't believe it. You can click Here. Love this transformation by In My Own Style. Wow, at this transformation and welcome this new blogger Decorating the Ville. Those are just a few of the wonderful before and afters. I hope you will check the rest of them out if you haven't visited any of the participants. You will surely be inspired. Just click HERE. Thanks again for sharing these at my party! I hope you will join me again for party number two. I will have the link up tonight! So much inspiration Kim. Thanks for the links to see their lovely transformations. Have a great day. People are so talented! I'm going over to check the links I missed. Very nice transformations! What a lovely job these bloggers did. Kim, I love to look at these before and afters. There are so many talented bloggers. FYI: The first two links are not opening for me. WOW, big moment for me!!!! Ok girl you have to get an *I've been featured* button so I can proudly wear it!!! I'm squealing with excitement and can't wait to call Jen! that entry transformation is incredible! Thanks guys for letting me know some of the links were not working. I should have checked them. I think my connection kept going bad when I was working on this out of town. Thanks for including me in those great before and afters Kim! I can't wait to see what everybody does this week. I think I may have completed a little project this morning that I can bring to your party!!! Looks like it was a fun and successful party. I just got back from FL so I couldn't get in on it. Kim, well, how about that! I opened your blog to see what awesome post you did today and saw my own dining room - Thought I'd opened up my own blog by mistake. HA! You are so sweet to highlight some of our entries. What a fun party. Thanks! Kim, enjoyed seeing all the transformations on your first then and now party!! Kim, those are some pretty awesome before and afters! Kim, thank you so much for the mention! How exciting! Loved seeing all the before and afters. Wow...some wonderful projects by creative bloggers. It will be fun to see the posts! Love the first pic of the dining room! Thanks for the link to Tracy's blog with her awesome bird project!